It's not often you see an obituary that reads like a plot outline for a Lifetime movie but here we are. Pop the popcorn. Plus, a couple of friends make good on a marriage pact and the fashion item you need this summer. It's not necessarily unusual to see an obituary go viral. We've seen some funny ones over the years. 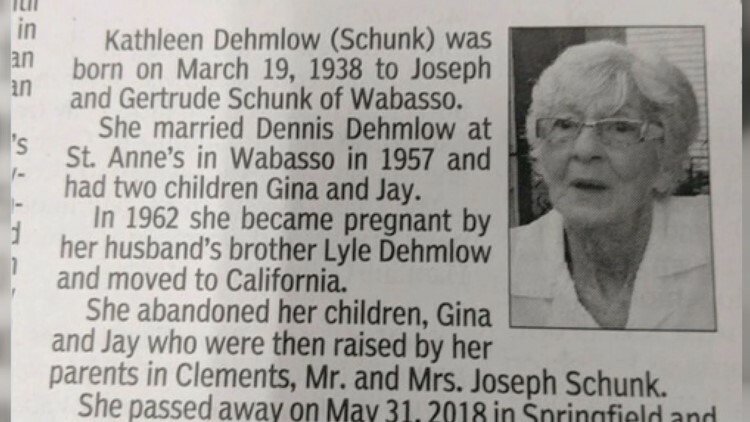 The look on Kathleen Dehmlow Schunk's stunned face is incredibly appropriate as you read her obituary situated next to the photo. It starts out innocently enough, noting the usual details--when she was born, who her parents were, her husband's name, the fact that she had two children,Gina and Jay. It is revealed that Kathleen had an affair with her husband's brother in the early 1960s. She got pregnant and ran away to California--leaving Gina and Jay to be raised by their grandparents. "She will now face judgment," it says before delivering this savage last line: "she will not be missed by Gina and Jay, and they understand this world is a better place without her." Another real life drama is giving the Internet all the feels. Decades ago, longtime friends and high school sweethearts Kimberley Dean and Ron Palmer made a pact: if they were both single by the time they were 50, they would marry each other. Kimberley is about 2 1/2 years younger so technically it was when she turned 50. Either way, a deal's a deal. The St. Paul, Minnesota couple got married last week. Both had been married before. Kimberley has two children. They say it really started as a joke between them but they remained friends for years, were part of each other's lives. They said it may have taken 37 years but they believe it was meant to be. Finally, we always have our eyes peeled for some ridiculous fashion on What's Trending. You can choose a traditional t-shirt or a tank top. The giant pocket that can fit everything from your snacks to several beers to a puppy, maybe even a goldfish bowl. The choices are endless. It's really perfect for those summer concerts and picnics. The ease and convenience of the giant pocket shirt will run you about $30.